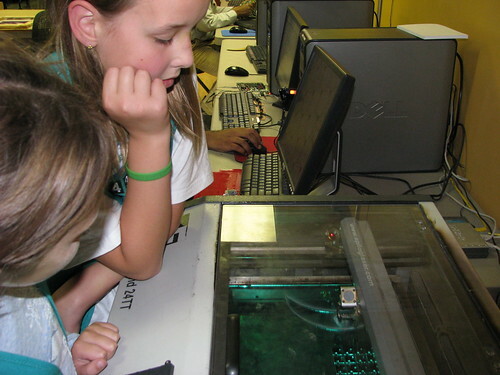 In the past few times at the SETC Fab Lab, I have been trying to pay close attention to users who are new to the lab. Here are a few reflections. I have 'given the tour' to a few new users, and listened as others do the same. The first time user presents an interesting opportunity. Each new person has the possibility to become an active participant making great contributions to the lab community. They could return later that week, or months later, or maybe never. I have seen each. One of the guys in the dorkbot group on Monday of this week told me he remembered a project I was working on with the laser last summer. My friend Lyle came back a week or two later with datasheets, schematics and a pretty clear idea of how his project should work and some opinions of the shortcomings of the Hello Board project. He still hasn't made anything, but his idea is getting much more focused. He is very much in the information gathering stage of the desing process of a sophisticated project. The intro tour might be something that we work to refine so that new users get a consistent and complete perspective on what the lab is and what its' possibilities and limitations are. I think people should be able to walk out the door with something original in their hand that they created on the spot during that session. The workflows of their session should be fairly established and easy to talk them through without us having to hand hold the whole time. They should drive the computer, and we should not have to touch the mouse. Not everybody needs to make something their first time, but it is especially important for people who are unclear about what they want to make. Taking something home will give them an 'idea trigger object' that will help them to come up with a more interesting idea for next time. There should be a scanner so people can transition from the hand drawn phase to the computer drawn phase more fluidly. We should probably try to take a picture of each new user with their first product and post it to the boston fab lab group on flickr. There seems to be a couple of categories of new users to the lab. - People who are familiar with the Design Process either formally or informally, can use it effectively and aren't discouraged by obstacles. - People who think they will 'get it to work just right the first time' and have little patience for failure in the process. If we can figure out where a person stands on these categories then we can probably steer them towards the ideas and activities best suited to them.